The name Ortok is only talked about openly in a few circles, and whispered in most. It is a name some associate with power, others with fear, and others yet with reverence. There are stories relating to how the great wizard Ortok managed to perform wondrous deeds, about how he defeated this monster or that demon or some other god, but there are many more stories about the great magical artifacts that he collected over the years. Most of these stories are just that. Ortok was indeed a great wizard, and did amass a sizeable collection of magical and non-magical treasures and artifacts. Unfortunately, he was also a crass man, and given to a number of distasteful pleasures and desires, which he often found himself acting upon in civilized society. This led to him being hounded and chased by other wizards, who took it upon themselves to attempt to not only re-educate him in the error of his ways with regards to fitness for society, but to relieve him of his collection. To defend against this, he broke his collection up many different caches, secret places that were difficult to get to and protected by magic and other defenses. Ortok has since passed from the world, but much of his treasure has still yet to be recovered, and wizards today still talk about the artifacts and power still waiting to be found. 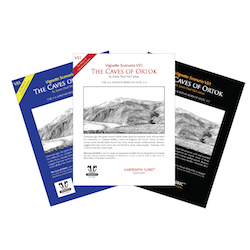 The Caves of Ortok is a module for 4-6 adventurers of levels 3-5. It is available in three different versions for different old school game systems: Labyrinth Lord, Swords & Wizardry, and OSRIC.